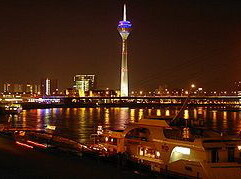 Located on the banks of Rhine River, Dusseldorf is one the most gracious towns of Germany. With all the exciting places closely located, the city of Dusseldorf is a very good place to visit during one’s vacation to Germany. After shopping on the streets of Konigsallee you can take pleasure in the beauty of Altstadt which is a primordial district of the city. Promenade is the integral part of the city. On the banks of Rhine River this activity becomes all the more interesting. A quiet evening stroll around in the evening is one of the best things to indulge in. Apart from places to visit and things to do availability of accommodations is also easy to find. 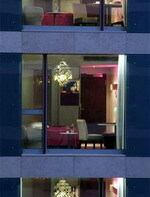 That is to say, Hotels in Dusseldorf can be found in all variety. In the exclusive residential area Dusseltal, you will find a stylish place to stay - the Boutique Hotel Haus am Zoo. Embedded in a British like ambiente, guests have the choice between the modern main house & a unique cottage. Altogether 10 single & 11 double rooms, one Junior Suite and family rooms. Like a green island, the 3 star stylish Boutique Hotel Haus am Zoo in Dusseldorf is used as the perfect recreation place. It is famous for uniqueness & privacy, and for it’s excellent service. 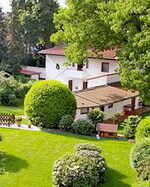 If you are on business trip or enjoying your City Break you find all important locations & destinations are in short distance: 5 km to the Dusseldorf International Airport and to the Esprit Arena & Dusseldorf exhibition centre, 4 km to the main station & to the famous shopping mile Konigsallee & the pittoresque old town on the banks of the river Rhine. A slate roof and dorma windows reflect traditional German architecture and contrast with the contemporary glass rotunda at the center of this modern hotel three kilometers from Dusseldorf Airport. Guests can get pampered with a sauna, Turkish bath, or top off their tans on the sun beds in the wellness center or work out in the gym. The 24-hour front desk operates a currency exchange service and bicycle rental. The bistro-style restaurant specializes in with international dishes, including Italian, French and Thai, in a bright, relaxed contemporary setting. Other amenities include garage parking, complimentary airport shuttle, and wireless Internet access in public area. 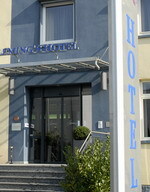 The hotel is next to excellent transport links into Dusseldorf city center six kilometers away. Sports fans will appreciate an 18-hole golf course and tennis courts close to the hotel. Dusseldorf Airport is three kilometers and less than a 10 minute drive away. 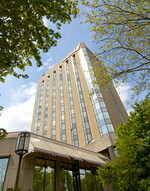 The Maritim Hotel Dusseldorf is located in Dusseldorf, Germany, seven kilometres from the city centre. The Media Harbour and Goethe's House are eight kilometres away. This contemporary design conference hotel is spread over eight storeys accessible by lift, and opens to a vast lobby area featuring columns and sheet-glass ceilings. At the Wellness Centre, there is a fitness room, an indoor pool, a sauna and solarium, and massage-treatment room. Further amenities include a multilingual concierge service, wireless Internet access, and 24-hour room service. Guests of the Maritim Hotel Dusseldorf can enjoy regional and international dishes in the modern restaurant. There is also a sushi bar, and drinks are served in the traditional beer tavern. 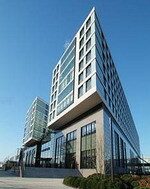 Radisson SAS Media Harbour Hotel is set in the thriving Medienhafen (media harbour) district of Düsseldorf, home to many lively bars and restaurants. Old Town is one kilometre from the hotel and the Kongsallee shopping district is two kilometres away. Guests can relax with a coffee and complimentary newspaper in the lobby. Complimentary wireless Internet access is available throughout the hotel for guests with laptops. The top floor of the hotel enjoys panoramic views of the city and has a sauna and fully-equipped fitness room. Business guests and groups benefit from two meeting rooms. Those arriving by car will find garage parking available for a fee. The hotel restaurant serves Italian dishes accompanied by wines from an extensive cellar, and extends to a Mediterranean-style terrace during the summer months. There are also two bars, both serving Italian and Düsseldorf snacks and international drinks. 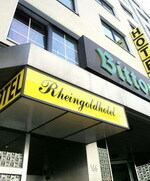 The Rheingoldhotel is a family-managed hotel in the centre of Dusseldorf, one kilometre from the historic Old Town and 300 metres from the famous Königsallee shopping area. With simple, modern decor and light cherry wood furniture, guestrooms open onto balconies and include complimentary newspapers and bottled water, satellite TV, direct-dial phones, hair dryers and wireless Internet. Those guests wishing to surf the web or catch up with emails can take advantage of the hotel's wireless Internet access. Guests can order light meals from the 24-hour room service menu, while the hotel's staff and concierge desk are also available 24 hours a day to offer advice on dining, festivals and concerts. The Schumacher brewery is 100 metres from the hotel and it is eight kilometres to the historical Schloss Benrath palace with its museums, park and exhibitions. Dusseldorf Airport is an approximate driving time of 12 minutes and a distance of seven kilometres. The contemporary, 16-floor Swissotel - Dusseldorf (Neuss) hotel is located on the left bank of the River Rhine in Neuss, Germany. The hotel is eight kilometres from central Dusseldorf, home to attractions like the Capitol Theatre and the Deutsche Oper. Dusseldorf International Airport (DUS) is a 20-minute drive away. A polished black floor, colourful rugs and floral displays brighten up the modern lobby at the Swissotel - Dusseldorf (Neuss) hotel. The Petit Paris restaurant has a turn-of-the-century ambience with red curtains, glass partitions and dark wood. The a la carte menu is French with international influences. Drinks are served at the bar. The Swissotel - Dusseldorf houses two large auditoria for up to 1500 people and there are 14 smaller conference rooms. The onsite health club comprises a gym, indoor pool, sauna, and steam bath. Massage and beauty treatments and a solarium are available (surcharge). The jogging tracks in front of the hotel follow the course of the River Rhine. The Tulip Inn Duesseldorf Arena is a newly build 3 star superior hotel, integrated in the ESPRIT Arena. The location makes the hotel ideal not only for business, and conference guests, but also for concert- group- and leisure guests. The adjacent fairground is at a walking distance from the hotel. Guests can reach the city centre within 14 minutes by subway, located opposite the hotel entrance. 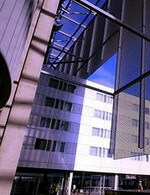 For international guests the hotel is only a 10 minutes drive from the airport. BRANCHE, a restaurant, bar and lounge, offers a fusion of European, Asian and American cuisine in a relaxed atmosphere. The modern designed rooms offer all necessary amenities such as highspeed-internet access or wireless LAN connection. Guests travelling by car can make use of our parking garage, equipped for holding 200 cars, for a surcharge.